This beautifully simple recipe is sure to become a new favourite in your home. 1. Bring a large pan of salted water to the boil. Cook the pasta according to pack instructions until al dente. 2. Heat the oil in a wide frying pan over a high heat. 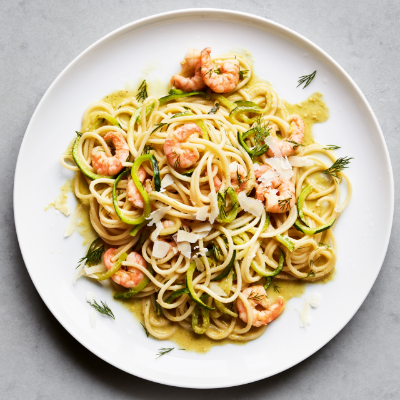 Sear the prawns for 3 minutes until turning golden, then add the courgette spaghetti. Season and cook for 2 minutes more, until the prawns are pink throughout and the courgette is just tender. 3. Reserve a cup of the pasta water, then drain. Using tongs, toss the pasta, dressing, Parmigiano Reggiano and the chopped dill into the prawn pan. Loosen with 3-4 tbsp pasta water and jiggle it over the heat for a moment. Season to taste. Serve with more dill leaves, Parmigiano Reggiano and a wedge of lime to squeeze over.